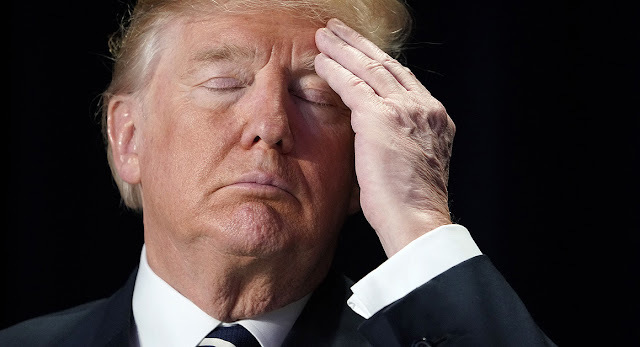 Target Liberty: Raimondo Flips on Trump:"Trump is simply not fit to be President"
Raimondo Flips on Trump:"Trump is simply not fit to be President"
[I]s he as stupid or stupider than George W. Bush? Or is he crazy? The case for craziness – a real mental affliction – is even stronger, in my opinion. When President Obama was confronted with the same phony “attacks,” as reported by jihadist “activists” and “medics,” Trump urged him to stay out of it. Yet now that’s he’s in the Oval Office, he’s doing what he urged Obama not to do. This is the classic behavior pattern of a schizoid nutjob with multiple personalities: it’s “The Three Faces of the Donald,” and the big question is which one will emerge today?.. Trump got into an argument with his generals over Syria. He wanted out: they insisted we stay. It didn’t take him long to find an excuse – this bogus “attack” – to cave. He’s a Beta male masquerading as an Alpha. Do read the entire piece here. "I would listen to the generals, but I’m hearing numbers of 20,000 to 30,000. We have to knock them out fast. Look, we’re not allowed to fight. We can’t fight." Trump is not stupid or crazy. He is doing what every president since WWII has done (WWII probably saved FDR's presidency). Engage in a foreign war when faced with domestic political challenges. And every president preserved his presidency except one. Nixon. And he was withdrawing from a foreign war. The lesson seems obvious and I'm sure its not lost on Trump. This is what democracy brings. A repetitive strategy that destroys human wealth and well being in order to preserve a corrupt political structure. Voting only serves to enable this tragic destructive behavior. Stop voting and embrace only voluntary transactions. 2 thumbs up Brian. I agree . "Trump is simply not fit to be President..."
I would like to know who Justin thinks IS fit to be president. Someone who is a committed non-interventionist either can't get elected or will end up like JFK. Intellectual heft is irrelevant, since the allegedly intellectual presidents (e.g., Wilson, Obama) took the US into wars that were nothing to do with the US, and engaged in tyrannical activities either at home or abroad. Who cares about the inputs -- character, personality, and intelligence -- if the outputs are all the same. It's the nature of the role, not the person filling the office. Exactly. No man is “fit” to rule over others. Great isnt it! Sometimes idiocy serves a great purpose in pointing out to the intelligent the folly of the stupid or insane! I suspect Trump just doesn't want to be JFK'd. Which would most likely happen if he stands in the way of the Pentagon and the CIA.